The Caggiano family business hits on the right equation for efficiency and profitability for snow-removal. 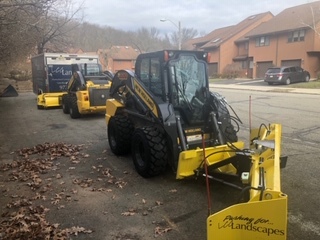 Snow removal is a numbers game for Lou Caggiano and his company, LCC Landscapes out of Fairfield, N.J.
It’s all about hitting equilibrium among the components of the efficiency equation – people, equipment and time – to get the job done, do it right the first time and finish as quickly as possible. Find that sweet spot, and the result is a stronger bottom line. Last year, with the addition of a new piece of equipment, Caggiano thinks he’s nailed it. Caggiano and his father, Lou Sr., are the father-son team that represent the third and fourth generations of the family that has been landscaping and moving snow in the Fairfield area for more than a century. Caggiano’s grandfather on his mother’s side started the business in a horse stable because at the time much of the work was powered by horse-drawn equipment. Later, in the 1920s, the business began plowing snow for the city in the 1920s, bolting wood to the tracks of motorized machines to avoid scraping up the city streets. These days, LCC employs about 17 people during the spring, summer and fall landscaping months. They’re split into three crews that do everything from landscape design installations and plantings to irrigation and leaf removal. When winter hits, Caggiano adds about 10 temporary employees for snow events. LCC takes care of five snow-removal contracts per year, including two condominium associations with 270 units and 110 units, respectively, and three office building lots. Caggiano says the condo sites are the most complicated and time consuming. Prior to the 2017-18 season, LCC crews included a guy operating a skid steer with a bucket attachment moving snow away from the garage doors and several guys with shovels clearing up trickles or whatever else the bucket missed. Another operator with a box pusher moved the snow from the center to the approved area. It worked fairly well, but the guys with shovels were always waiting on the machines. That was time wasted. In addition to the potential time savings, he liked the fact that the QuattroPlow’s wings move all the way back – something that isn’t available on other attachments – and there’s no need for an electrical hook-up. “This is a much better built attachment than many of the others we’d seen, and it was less expensive,” Caggiano said. LCC bought two QuattroPlows for 2017-18, one for each of the condo sites, and the results have more than justified the purchase. The QuattroPlows backdrag snow from five or six units down to the street, then the operator flips the wings forward and moves it down the street. And unlike the buckets, the Quattros angle to trickle snow off to the side of the driveway. Rather than multiple passes with 84-inch or 96-inch buckets, the QuattroPlows clear each driveway with just one. The QuattroPlow cuts the crew’s time down by about a third, which, in turn, cuts manhours by about a third. In other words, one crew plus one attachment equals one-third of the time, which in turn equals more profit. That’s math Caggiano can get behind. Based on those numbers, he plans to purchase a third QuattroPlow prior to next season.